While I’m no expert in the subject of staging; I do know staging the home before I photograph it creates the best results and has the biggest impact on buyers. After all, we want them to be inspired by what they see and to reach out and make that showing appointment. Nothing beats a proven professional stager, but, when the budget is not there for their help, it’s DIY time. Of course, there are varying degrees of staging; everything from complete redecoration, fresh paint, new furniture, new artwork, lighting, flooring, right down to the new plates and tableware on display. For this article, I’m going to address the lesser degree of staging and that’s making use of what’s already in the house and setting it up for the best possible photography results. Have you ever walked into a new listing, even on the first appointment and said to yourself, this place makes no sense? Well, that’s a definite sign that there’s some work ahead. 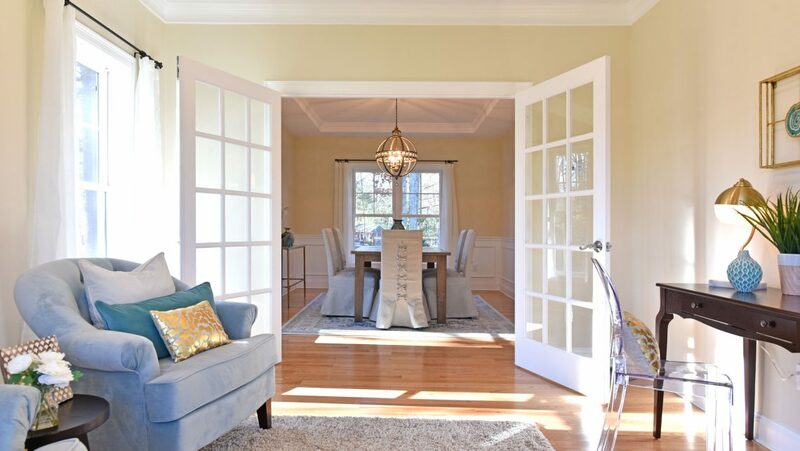 According to professional home stager Shannon Brito of Premiere Home Staging in Warwick, RI there are a few things to consider right off the bat like what to do with family photos for one, “I suggest people remove personal photos for a few reasons. First, you want buyers to envision themselves and their families living in the house, which is tough if they are looking at your family. Second, as a safety precaution. You don’t need potential buyers to see you and your children. Third, you want buyers to feel comfortable. Seeing your family photos makes them feel as though they are intruding in someone else’s home”. The rules of MLS state that we can’t show the faces of anyone in the listing photos and when it does happen, I need to blur them out to make the unrecognizable. Along with family photos, any and all uniquely personal belongings should be stored away, even packed in boxes in the garage or basement ready for shipment to their new home. They plan to move anyway, right? When thinking about furniture and traffic patterns; taking a look at the placement, condition, and size of furniture is important. We should try to present the house as plainly and logically as possible taking into account the foot paths that lead in and out of all major living spaces and rooms. Regarding furniture, Shanon Brito also states, “Anything very tall or bulky will overwhelm even a large room and give it what we call “the titanic effect”, where it feels like the large furniture is sinking the entire room. It is very, very common for me to go to people’s homes and find that they have way too much furniture, especially big and bulky pieces, and too much stuff in general and not enough accessories (or what I would call soft goods- throw pillows, area rugs, window treatments). The good news is that it is very easy for me to suggest small changes that make a big impact. Removing large furniture, starting the packing process and a quick trip to HomeGoods can really make the difference in a sale”. Starting with the basics is always the best first step towards making your listings shine because we need to take the shots that sell and get you and your clients on the road to a successful sale.